The ITER cryopumps are high-performance components that must fulfil demanding operational requirements. With a pump volume of 1,400 m³ and 8,500 m³ respectively, the ITER vacuum vessel and cryostat count among the largest vacuum systems ever built. With a volume of 1,400 m³ and 8,500 m³ respectively, the ITER vacuum vessel and cryostat range amongst the largest vacuum systems ever built. Sophisticated techniques will be necessary for the monitoring and maintenance of these systems: once in operation, there will no longer be access to the machine. Vacuum pumping is required prior to starting the fusion reaction to eliminate all sources of organic molecules that would otherwise be broken up in the hot plasma. Vacuum pumping is also required to create low density—about one million times lower than the density of air. Mechanical pumps and powerful cryogenic pumps evacuate the air out of the vessel and the cryostat until the pressure inside has dropped to one millionth of normal atmospheric pressure. Considering the volume of ITER, this operation will take 24 to 48 hours. The main pumping systems are the six torus exhaust pumps, the four cryopumps for the neutral beam injection systems used in plasma heating, and the two cryopumps for the ITER cryostat to maintain the low pressure required for the operation of the superconducting magnets. 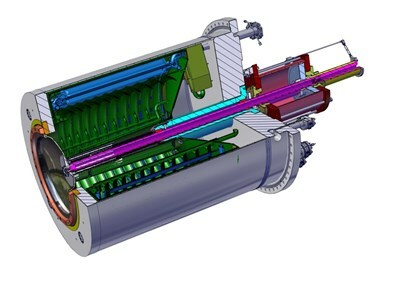 The complex pumps have been tailored for the very specific applications and requirements at ITER. All are based on cryopanels, cooled with supercritical helium and coated with activated charcoal as sorbent material. Research and development has shown that charcoal from finely ground coconut shells has the right density and porosity for imprisoning the helium particles in ITER.